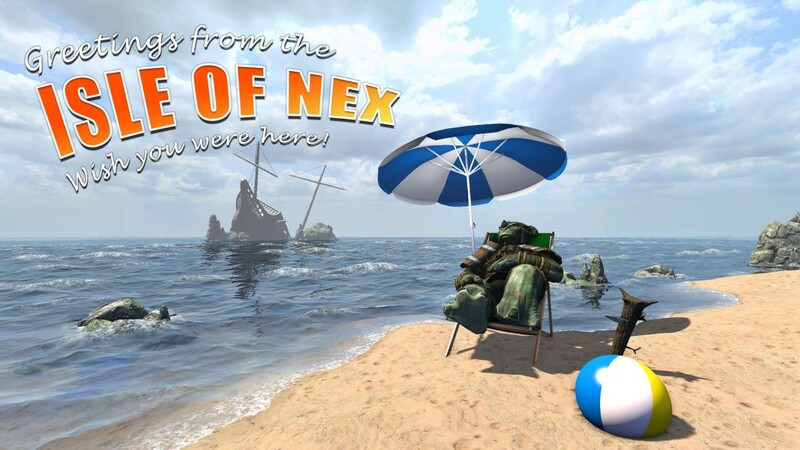 Greetings from the Isle of Nex! It is the thirtyeighth day of my journey. The sea has been strangely calm for weeks with nought but a slight breeze and no drops of water from the heavens. The Ratling captain says that this is an ill omen, for in this season rains should be plentiful. The reports of strange structures on the Island are perplexing to my mind. Surely some of them were made by the natives now long lost to the mists of time. But the tales of seafarers also tell about more recent, grander constructions towering above the trees. The natives and the priestesses long gone, who are building these structures and why? The seamen believe that the Island is cursed — I say guarded by strong Magicks — since no ship sailing close to the Island has ever returned. Perhaps the ancient statues reported by the few survivors of shipwrecks are there to guards the secrets of the Island until the constructionwork is complete? Perhaps with the careful usage of the Art we are able to dispell the shields and grant us entrance to the Island? Perhaps the King’s endless thrist for knowledge shall be finally quenched? Perhaps. There are black clouds billowing in the horizon. The storm is rising. Hello all! We have been pushing hard on the development of Legend of Grimrock 2 and now we are going to have a brief but sweet summer break. But before we go a recap of what has been happening is in order! With the added musclepower of Jyri and Jyri, we have been able to push an impossibly large amount of 3D models, animations and textures out of the oven in a very short time. For example, we have 16 complete new monsters and more is coming. Combined with the monsters from Grimrock 1 we have something like 40 unique monsters, although many of the old monsters won’t make a come back in the new game. The monsters of Grimrock 2 are also much more complex, many with multiple types of special attacks and unique AI behavior. On the tech side, we have implemented water rendering and integrated a video player. After carefully evaluating our options we chose to use an open source WebM/VP8 video format. Being open source means that mods can also contain cinematic videos without licensing limitations. This was very important to us. The cinematics can also be played whenever needed, no longer just at the start and end of the game. That’s it! Have a great summer! This is looking great, guy, any idea on when pre-orders will be available? I pre-ordered the first one, and I’d like to do the same to this. We definitely want to do a preorder. But not until pretty close to the launch so the waiting time is not too long. Enjoy your vacation! The new additions sound great. Also, I see Alarast from the game manual has made a comeback! Thanks, Jack! We surely will! Great news! Are you willing to reveal a bit on how the champion classes/skills will be organized? It would be great if modders would be able to add new skills beyond the rigid list of skills that came with predefined classes. And definitely +1 for preorder. Enjoy your vacation! I’ll definitely buy the new LoG. But can I expect a bigger variety of spells and skills? Just curious,since one of the bigger reasons I love the original is the RPG nature of it. We’ll let you guys know when we make progress with the skill system. Great stuff. I cant wait to make in game cinematics. Looking forward to all the new stuff I can play with. Are you guy making weather patterns, Stores, NPCs? I am very much looking forward to the new monsters as well and seeing how I can adapt them and change them around with all the neat tricks I know. I hope Johnwordsworth’s toolkit works with LOG 2. As long as there’s a specification for the model format, I’ll be maintaining a Model Toolkit :p. Although, I’m considering rebuilding it with C++ so it works on OSX/Linux, as well as making it easier to add FBX support! There is a good chance that the model format is identical or only slightly modified. We’ll probably need to compress animations though (the old animation format is quite a memory hog). LoG2 will have lots more animations than the first game and we don’t want to increase the required system specs too much. It’s some very great news ! Very GG to all of you for awesome jobs ! Do you already have some ideas about the new potential skill system ? Yes, we have a few ideas about the skill system but we need to do some prototyping first to see how they work in practice. Many times a good idea on paper is not fun when implemented in game, or vice versa. Thanks for another great update – the water shader looks amazing. Very cool to hear that there will be a whole new set of monsters to meet and greet and it’s great to hear that you are putting some extra thought into new spells as well as the skill system. Hope you guys all have a great holiday! Another great update, the water shader is amazing too. Does it work on individual tiles (eg, to put a river in a dungeon) or just on large planes? Great news for monsters and environments, you can be sure I’m on the preorder list the day it launches! 🙂 I hope you all gave a nice holiday! New water shaders will be very nice, under water effect also would be very nice or under water dungeons with under water breathing spell. Weather effects like storms , rains , lightnings and day – night circle will give too much realistic RPG atmosphere. One month without news? it doesn’t help me control my anxiety!!! give me my fix please!!! Sorry, our minds have been so full with new ideas after coming back from the holidays, so we haven’t really had time to update the blog! btw. what would you like to hear about in the next blog update? OK. I’m tired of waiting for Legend of Grimrock 2 already so get back to work. We’re back to work already, just haven’t found time to update the blog yet. On the subject of the skills, are you thinking of making them a little more branching, perhaps? Something to give more choice. The skill system in the original was very linear and really didn’t favour the player spreading their points between skills for an individual character. Yes, we’d like to improve the skill system so that putting every point into one skill is no longer the best strategy. We’d also like to chance the magic system so that mages are not so über-specialized in one magic school. We haven’t really started working on this so we don’t know the details yet.